High performing facilities recognize the importance of having formal training and certification programs. Training ensures procedure writers have the necessary skill set to provide highly reliable and technically accurate procedures. ATR provides hands-on procedure writer's courses to qualify your subject matter experts in the highest writing standards. We adhere to best practices with a focus on human error reduction and optimizing efficiency. Our experts have years of experience in all facets of procedure writing, including supervision, procedure management responsibilities, writing skill, and operator and maintenance training. ATR courses are tailored to the experience level of your writing team. Two day, three day, and five day workshops are offered, along with our industry-recognized certification program. 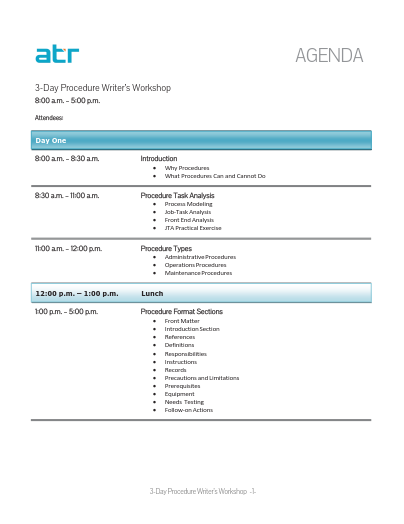 The Procedure Writer Training and Certification Program is a three and one half day course that targets industry procedure writers of any experience level. This program provides key knowledge needed to author high quality, reliable, and usable procedures. The program addresses all the major components of a quality procedure: format and content, human factor engineering, and human performance error precursor elimination.